Here comes the end of the year 2011, I'm gonna miss this year and looking forward for a better 2012. Happy New Year to you guys in advance, and I hope that you guys can really enjoy your day. Will only summarize my week with only a post since I didn't get all the photos yet from friend. Ah Gan was in Penang and we hang out together with his cousins, it was a pleasure to know them all, and you all really make me feel itchy heart to get the shirt! Next time I'll wear that to show you guys, Laugh. Sorry because I don't have more time to accompany you guys, I know you won't mind. Had my Zoo Is Cute gathering last night and really talked a lot, sat in the Starbucks and only got back when the cafe nearly wanted to close. I wish we could have more gathering, and we never bored to stick around together. Thanks for the night, really; I love you guys. 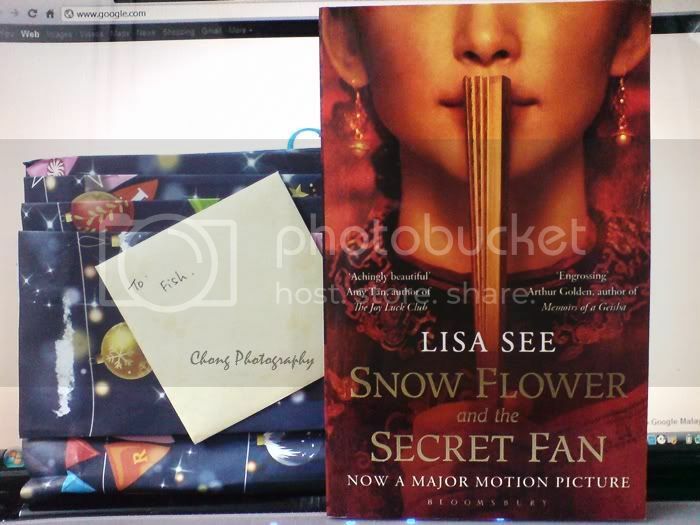 Got a Christmas pressie which I heart so much - Snow Flower and the Secret Fan from my friend, this movie is coming soon, next year perhaps. Thank you to all my friends that bear with me throughout the years, let's have new resolution in coming new year! Smile. I'm perfect with my imperfectness, I know.